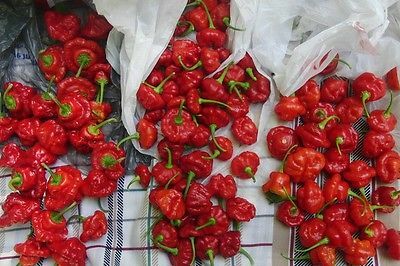 Red Scotch Bonnet Pepper Seeds ♥ Firey Hot!! Red Scotch Bonnet Peppers are just about one of the hottest peppers you will find today. This is one firey hot pepper. It is globular shaped fruits ripen from green to fire engine red when ready. It is wrinkly and about 1- 1 1/2" in size. Very short bushy plant and is late maturing. Used in a number of dishes including Jamaican Jerk sauce.